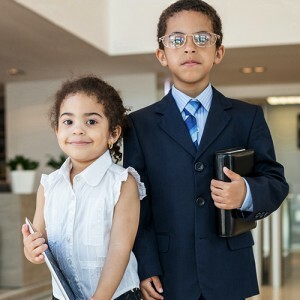 Everyone knows you can generally claim your children as dependents on your personal tax return, but there may be a way to also deduct them as a business expense. Put them to work! That’s right, hire them as an employee if you own your own business. Just remember, the work performed needs to be necessary to the business. You might need that company car washed or someone to run to the post office every day, or go pick up office supplies. If it would be reasonable to pay someone else to perform these tasks, you can pay your child to do it. But be careful that the job is reflective of the child’s age. You may pay your computer savvy 17 year old to design a website. But you wouldn’t have your 8 year old do the same task. Just remember to treat your child as you would any other employee. This means setting a schedule, punching a time clock or sending them to training courses. Their compensation must also be reasonable and consistent with what you would pay an outsider. And as always, keep good records. Not only can you deduct the wages paid to your children, but in certain instances you can also save on payroll taxes. This means they take home more money in their paycheck and the business may not be required to pay Social Security and Medicare taxes (FICA). Further, it’s a great way to shift income from your higher tax bracket to your child’s lower tax bracket and they may not even be required to file a tax return. It’s also a great way to jump start their retirement by putting money away into an IRA. In a report released on August 28th, the IRS reported that individual income reported in 2012 jumped by 8.7% over the year before, and the number of tax returns reporting Unemployment Benefits dropped by an encouraging 22.9%, and cancellation of debt income, common in foreclosures or short sales, fell by nearly 10%. Both of these statistics point to an economy that is slowly improving overall, since people are making more money, less of which is made up of unemployment benefits, which points to rising wages and decreased unemployment. In a recent Money Magazine article, a survey revealed that 61% of adults with children don’t have even a basic will in place. Many don’t want to think about death, and some believe that wills are only for people that are elderly or “rich”. In reality, visiting an attorney and discussing your situation is money well spent. Even if you don’t think you need one, you might. Do you own your home? Do you have things that you want a specific person to have when you pass away? Do you have investments outside your retirement accounts, or want to use your money to provide for future generations? If your answer to any of these is “yes”, it would be wise to seek out an attorney who works with estate planning. The American Bar Association (ABA) has a great FAQ section on estate planning, which can give you some additional items to consider, and can be found here. Should you decide contacting an attorney is right for you, ask your family and friends who they’ve used, reach out to other professionals like your CPA, or use the ABA’s website to find an attorney near you. In a recent tax court case, the taxpayer who is a self-employed nutritional supplement salesperson, deducted expenses for travel, vehicle, meals and entertainment allegedly related to his sales business. Even though the taxpayer kept a mileage record on his calendar, the record lacked specific and necessary information on how and why the mileage was related to business. The taxpayer supplied a spreadsheet to the court in support of his deducted meals. However, he admitted that many of his meals were eaten alone. The tax court concluded that the records and substantiation supplied were not reliable and could not be considered “adequate records” as required by the tax code. The morale of the story…Document, document, document! Each claimed meal and mile must be directly related to or associated with an active trade or business or for the production of income. And specific documentation must be kept to substantiate the deduction.